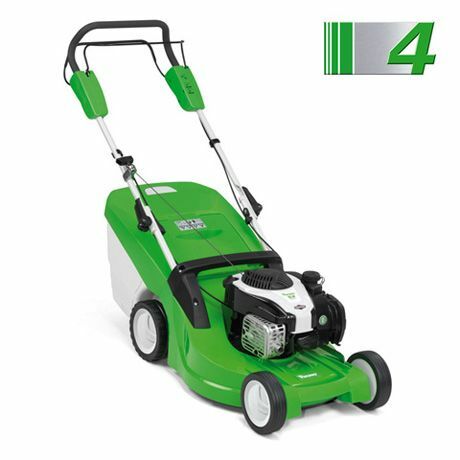 This compact self-propelled lawn mower with a 46 cm (18") cutting width gives an excellent mowing performance on small to medium-sized lawns. With its easy operation, sturdy polymer housing, innovative engine technology and central cutting height adjustment, mowing the lawn is a simple and efficent.. The 55 litre capacity grass box comes with a level indicator and is easy to open, empty and clean. 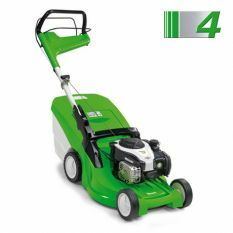 This top-of-the-range VIKING 4 Series self-propelled lawn mower comes with a 46 cm (18") cutting width and mono-comfort handlebar. Providing exceptionally easy emptying of the grass box, the handlebar is both foldable and height-adjustable with 2-settings. Ideal for small to medium-sized lawns, the MB 448 TC is easy to operate, includes central cutting height adjustment and a 55 litre capacity grass box with a level indicator which is easy to open, empty and clean.